Our recent addition to the family prompted a space reallocation. M got the old office and A got M’s old room. 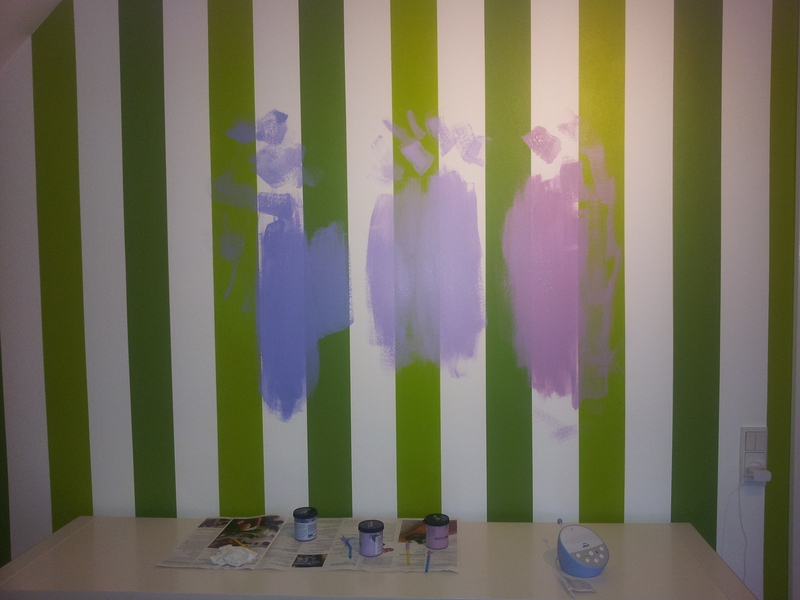 Most of M’s old room is white, but a single wall was painted with stripes of white and two shades of green. 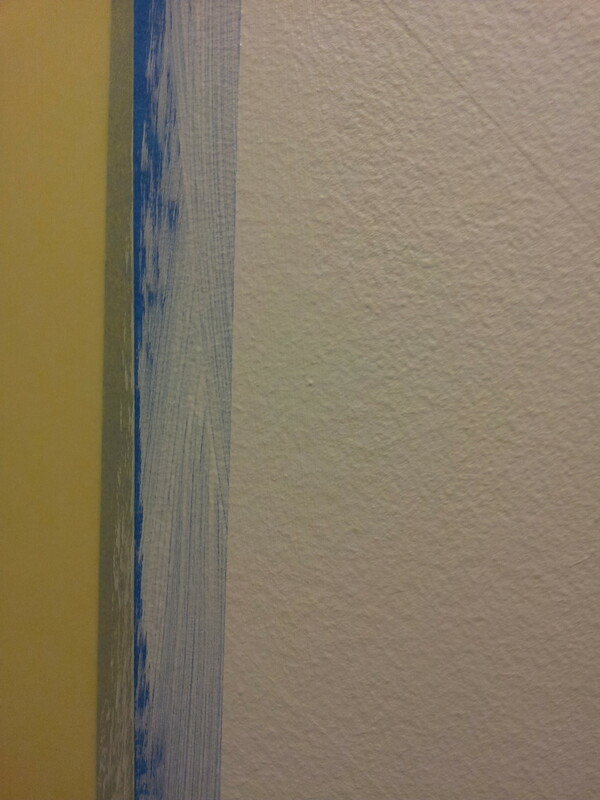 Painting 10 centimeter wide stripes in alternating colors on a whole wall is fairly time consuming, (but a cheap alternative to putting up wallpaper) which is why K reassured me that the colors were gender neutral and I would not have to repaint the room, if we got a girl at some point. Turns out gender neutral colors change over time and 3 years later we are repainting (purple with a white border)……deep down I guess I knew this would happen. Get a good quality masking tape, which will make removing the tape cleanly a lot easier. You will need two colors of paint, even if your wall is allready the color you want as a base. Even the best masking tape will still let some paint bleed under the edge of the tape and the only way to get around that problem, is to control which color bleeds under the edge. The process is best explained with an example. 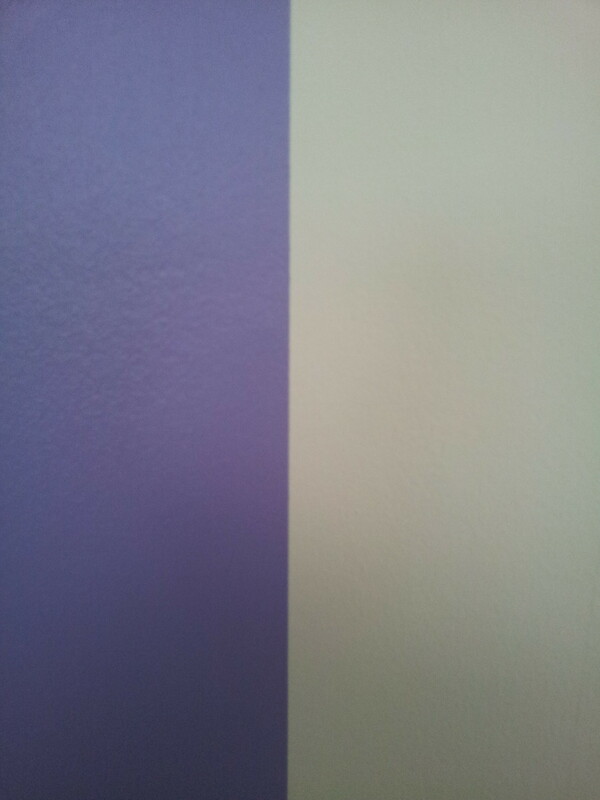 Say you have a white wall and you want to paint a purple stripe on it. Start by masking off the border of the purple line, making sure to press the masking tape thouroughly to the wall. Paint the border of the tape you want to end up as purple, white (the base color) and let it dry. This allows the white paint to bleed under any part of the tape that is not completely closed off. Paint the stripe purple, making sure not to go beyond the outer border of the masking tape. When you have finished with the last layer of purple, peel off the masking tape carefully to reveal a nice clean border between the two colors. Keep your brushes in a closed plastic bag and you will be able to paint with them over and over again without rinsing, for at least a week. So A’ room now has a purple wall and I thought the room was finished, but last week I overheard K telling some friends that she has some regrets about the color and now wants wallpaper instead!! !……….